Pennsylvania&apos;s senior senator decides he&apos;s not going to be the last one off the sinking ship. It&apos;s official: the Republican Party has hit rock bottom (as far as its influence goes, at least; if you&apos;re talking about ethics, that would be this or this or...nevermind). 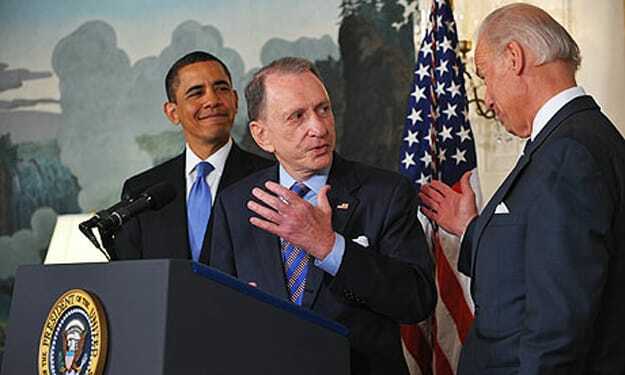 Yesterday, Pennsylvania senator Arlen Specter announced that he was switching from the GOP to the Democrats, which, along with the election of Jack Handey Al Franken in Minnesota, gives the Dems a filibuster-proof majority in the Senate. • The Republicans have always done well with senior citizens, so why not just make them the entire electorate? True, the Baby Boomers will be turning 65 soon and a lot of them are Democrats, but once you've moved the voting age to 65, 85 doesn't seem like much of a stretch. • Set air conditioners at 45 degrees, light cigars with chunks of coal, turn the Indy 500 into the Indy 3000—whatever it takes, GOPers should be trying to ramp up greenhouse gas emissions. When the polar ice caps melt, the liberal, Blue State coasts will be the first to go. Sure, reliably Red (the good kind!) Houston will be sacrificed, but that's a small price to pay for taking out San Francisco, New York and Portland in one fell swoop. • Just in case the whole "raising the voting age" thing runs into a couple speed bumps, someone's got to remind the kids and "urban" audiences that the GOP is the party of Lincoln and Eazy-E. Daddy Yankee gave it a good shot last year when he endorsed McCain, but the trick is finding a pitchman who's well respected in those communities. Let's see...looks like this guy&apos;s pretty popular right now.